This site will look much better in a browser that supports	web	standards, but it is accessible to any browser or Internet	device. Honey is made by bees from the nectar of flowers. There is no equivalent, no man made sweetener that equals honey. Pure honey contains minerals, enzymes, pollen - and is a natural anti-biotic substance. Many people ask us, "How do I know what honey to buy?" With so many bottles of honey on the shelves of the grocery store it is understandable to be confused. First you want to look for pure, raw honey. This means the honey has not been mixed with sugar water, corn syrup, or anything else and that the honey has not been heated. Heating destroys the enzymes in the honey. Many honey producers heat their honey so that it will flow more easily and quickly. This saves them time in the bottling process, but it changes the taste and the health benefits of the honey so beware! Honey bottled by a beekeeper as compared to a honey producing company also increases the chances that you are getting real quality honey. So buying local, from a beekeeper is nearlyl always best. Local honey of course also supports local agriculture, as bees are necessary for the pollination of many foods we eat. A healthy environment includes local honey bees! Many of our customers return for our local honey, claiming that it helps them with their seasonal allergies. While I do not have allergies to confirm this myself, and I cannot find conclusive scientific evidence to support this claim, it is none-the-less frequently mentioned by our returning customers. Honey can be used to help soothe and heal sore throats by drinking it diluted in water, or just eating it straight. It also will help to seal and heal wounds - just coat the cleaned injury in honey then cover with gauze to prevent the honey from sticking to other things. Many hospitals around the world are now using honey in their burn units. Honey keeps the wound moist, yet prevents infection as the burns heal. 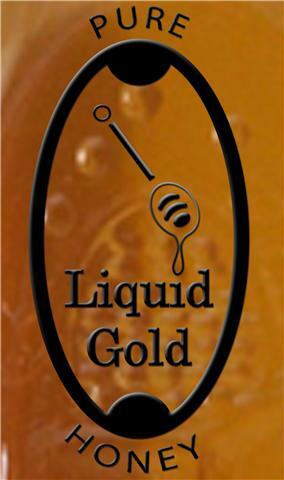 Liquid Gold Honey is 100% pure, unfiltered, raw, organic honey. It is a raw honey with fantastic flavor. Yes, you can find honey in the grocery stores for less, but it is not the same quality of honey. Our honey is local, which means the bees harvesting here contribute to your environment and your dinner table. So support local. Our honey is raw and unfiltered, which means it hasn't been heated and run through a filter, allowing all of the natural minerals, enzymes, and other healthful properties to remain intact and undamaged. These are qualities you won't usually find in the honey for sale at the grocery store. All of our honey is 100% pure, unfiltered and raw. We love our bees and make a point to keep them healthy and never use pesticides or chemicals on our hives. Liquid Gold Honey is never heated, filtered or pasteurized allowing trace pollens, minerals and active enzymes to be present. This creates a delicious, flavorful and incredibly nutritious honey!